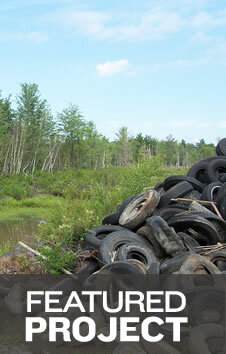 After the June 2006 flood, the Hooper Road embankments experienced severe undermining and loss of material. Shumaker Consulting Engineering & Land Surveying, P.C. (SCE) provided design, survey/mapping, environmental and construction inspection services for this rehabilitation project. SCE was responsible for designing the stone retaining wall along the Hooper Road ramp and embankments. The total length of the wall was 150 feet. 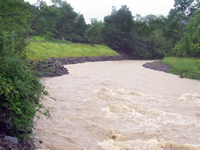 As a result of the June 2006 flood, severe erosion occurred along the Jennings Creek Streambed adjacent to the local road in the Town of Lisle. 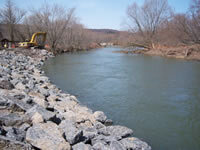 This FEMA sponsored project provided the rehabilitation of the roadway and stream embankment. Shumaker Consulting Engineering & Land Surveying, P.C. (SCE) conducted a field investigation to assess the flood damage site, including heavy loss of embankment soil with encroachment to the Jennings Creek Road and spur; and assess the road’s drainage conditions contributing to the erosion issues. Preliminary design investigations included a hydrologic/hydraulic analysis of the creek, drainage studies of the road, subsurface exploration and cost estimates. 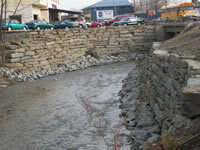 Remedial actions for this project included creek realignment with placement of heavy rip-rap to protect the stream bank from future floods, placement of the rock veins along the creek bed, drainage ditches along the roadways, roadway intersection reconfiguration with new pavement and 220 feet of new guide railings. The Village of Sidney was subjected to a severe flooding event in June 2006. Both New York State and Federal Disaster Emergencies were declared. Among other impacts incurred by the Village was substantial damage to approximately 300 linear feet to the southern bank of the Susquehanna River, adjacent to the Village water supply wells and wastewater treatment plant. Shumaker Consulting Engineering & Land Surveying, P.C. (SCE) provided survey/mapping, engineering design, and construction administration for this FEMA-sponsored emergency project. The design effort included technical coordination between the Village of Sidney, conformance with preliminary scope and schematic drawings and coordination with FEMA, surveying and mapping of the bank area and select river transects, permitting regulatory agencies, detailed engineering design, preparation of construction documents, and construction inspection and oversight. SCE prepared all required design documents and drawings and permit applications to submit to the U.S. Army Corps of Engineers (COE) and the New York State Department of Environmental Conservation (NYSDEC) for permits to conduct the stabilization project.